Active shooter training can empower your staff and help keep your employees safe. 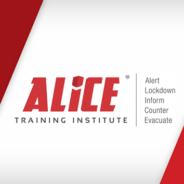 Organizational Architecture has been privileged to work with The ALICE Training Institute since 2017 as their Human Resources partner. As we have gotten to know and work with them, we wanted to help get their message out to our other clients who may want to learn more about their training programs and how they can help your employees and customers stay safe. The mission of ALICE Training Institute is to SAVE MORE LIVES. Their program empowers individuals to participate in their own survival using proactive options-based strategies in the face of violence. These life lessons are critical to helping ensure people have an effective response to active shooter situations. Most organizations could benefit from their training. If you would like to learn more, contact us and we can connect you with their Program Management team to get your training scheduled.